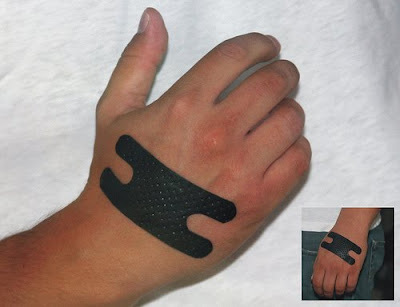 Scott Amron of Amron Experimental has come up with a chic and clever way to fashionably "dress your wound". 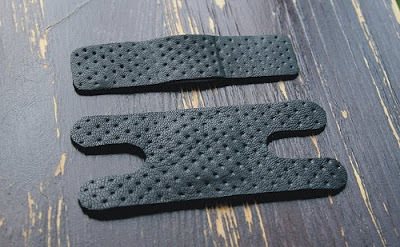 The New York designer/artist and electrical engineer sells his "Hurt Couture" pressed black leather bandages 3 to a pack for $15. He claim that the leather actually breathes better. Not sure if that's true, but they certainly look better. 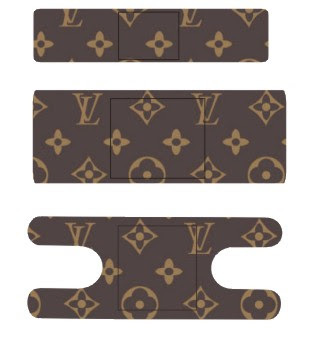 He intends to come out with some Louis Vuitton ones, too (shown above) but for legal reasons they are called Luis Vuitton bandages. Get on his mailing list for those here. Interested in other types of luxury first aid? • Check out the sterling silver bandage rings by Michelle Lopez at Artware Editions.